How or in which ways is nostalgia alive in my life? 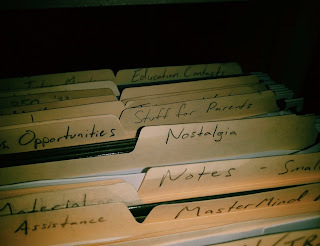 I have a file folder for it - paper stuffs that make me smile when remembering their creation, and would certainly make for good conversation with those who were directly involved, way back when! Mostly, it's about shared times with others, but there's also many nostalgic times with inanimate objects like pasta and meatballs. Nostalgia also motivates me - like a reminder of myself in a different moment, I explore the differences from who I was then to who I am today? And what happened along the way? In what ways would I like to redefine this word for myself? Find the gift, for the me of today. When I have gone through the effort to create an emotional relationship for something in the past, then maybe I've bookmarked it for a reason. But the key is to not just float off into the feeling aspects of nostalgia, but to more scientifically extract the words around the feeling, to understand why I've created this emotional bookmark in the first place. What is the attachment for? What do I fear not having? Getting really specific with myself, so I can practically make use of this information, in terms of re-manifesting the best parts of me that I know I have been and can be.